The four-star Ramada Hotel Singapore and the three-star Days Hotels Singapore at Zhongshan Park are 2 of the latest Wyndham Hotel Group properties to open in the Balestier/Novena area in Singapore. These hotels offer upscale yet comfortable accommodation for both value-conscious business and leisure travellers. The room configurations at Ramada Singapore at Zhongshan Park are simple – King or Twin Bed with City or Park view. Each room comes with a 40″ LED TV (with cable channel access) and complimentary in-room Wi-Fi. You can expect in each room distinctive décor and refined touches designed to cater to both business and leisure travellers. The hotel provides guests with home-away-from-home. There is also a comfortable settee just by the window for you to enjoy your city/park view while chilling with a cup of tea (complimentary tea sachets provided!). The bathroom/toilet is “open concept” – check out the big glass window separating the bedroom from the bathroom! Don’t worry – you can still shower in private with the roller blind by the window! 🙂 There is a standing shower and bathtub in each room – bath amenities e.g. shampoo, body wash and conditioner are provided (in addition to shaving and dental kit) too! The breakfast buffet spread at Ramada Singapore at Zhongshan Park (1st floor at Flavours at Zhongshan Park) was adequate with the usual full-English breakfast offerings such as bacon and scrambled eggs as well as an omelette station. 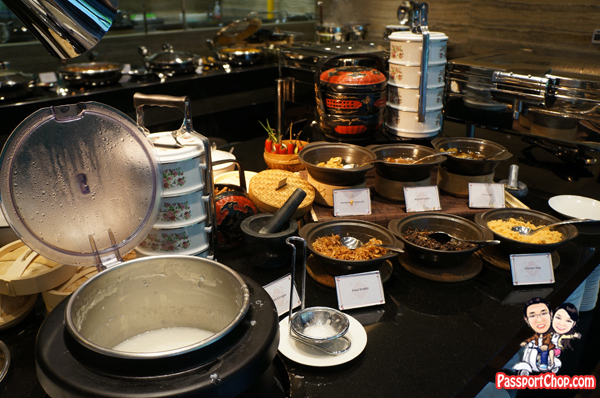 You can also help yourselves to the more Asian breakfast offerings such as vegetables and fried noodles – the self-service porridge station offers quite a number of condiments to complement your porridge. If you are looking for a light continental breakfast, pastries and croissants are available with yoghurts and fruits nearby. If you are lazy to grab breakfast at Flavours at Zhongshan Park (totally understandable especially after a long day checking out the Balestier Heritage Trail and you just want to sleep in for your staycation :-)), you can also check out the around-the-clock room service. 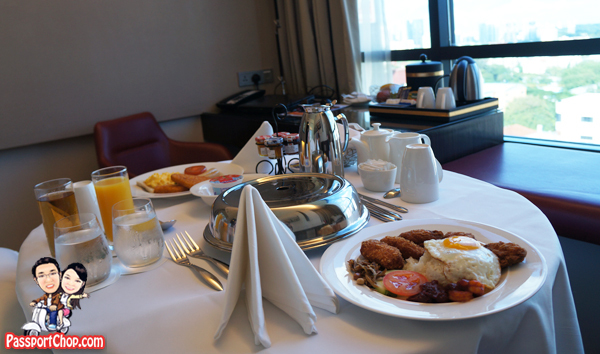 Where better to catch a view of the city skyline with in-room breakfast dining. 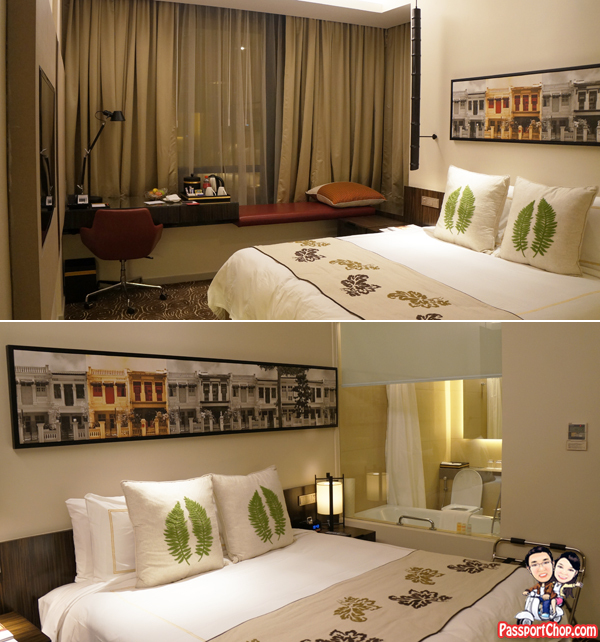 Realistically, I want to manage your expectations here – the views can’t beat those of Ritz Carlton but the comfort of waking up late and dining by the bed while catching our favorite episodes of CSI on TV is just shiok! What’s really cool about Ramada Hotel Singapore is that there is an adjoining two-storey shopping centre – Zhongsan Mall with restaurants, eateries, shops and an NTUC Finest supermarket so if you are feeling hungry during your staycation at Ramada Hotel Singapore at night (as long as its before NTUC Finest’s closing time at 11pm), you can come down to grab some cup noodles and snacks. 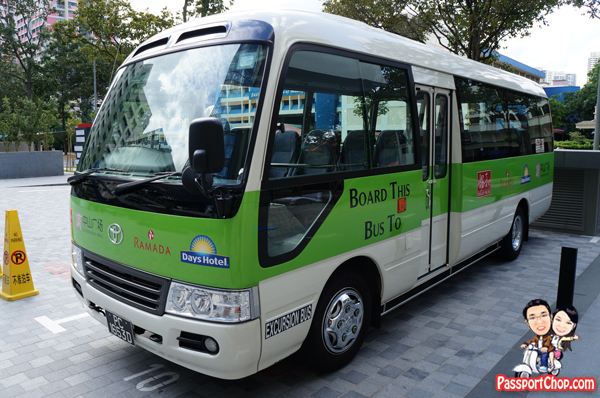 Situated within the central district of Novena, Ramada Hotel Singapore is a mere five minutes’ complimentary shuttle service away from Novena MRT station, the Velocity and United Square shopping malls and office towers, the Novena Medical hub and the newly-opened Mount Elizabeth hospital. 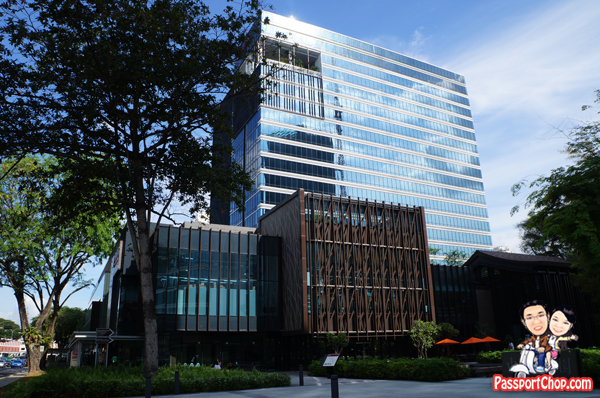 From Novena MRT, you will be only two MRT stations away from the famous shopping district, Orchard Road. If you are planning to renovate your house or upgrading lightings/toilet fittings, a staycation at Ramada Hotel Singapore will be perfect as you can do a recce of all the shops offering lighting fixtures along Balestier Road and return back to your hotel room (after a long tiring hot day) to compare notes before the next round of recce or confirmation of your purchase. Besides all the renovation stuff, Balestier Road is also known for its Bak Kut Teh (Rou Gu Cha) or Pork Rib Soup. There are quite a number of Bak Kut Teh shops along Balestier Road including the more famous Founder’s Bak Kut Teh. Personally, my vote goes to the Bak Kut Teh stall at Kai Juan coffeeshop. The stall at Kai Juan operates 24 hours every day, except on Sunday when it opens till 2pm. It has a misleading sign that says in Chinese that it’s a “Morning business Bak Kut Teh” but actually, it has two shifts of workers. It is located at 395 Balestier Road (junction with Prome Road and next to Boon Tong Kee – you can order the famous Boon Tong Kee chicken rice to consume at Kai Juan coffeeshop – they will deliver it there!). History and culture buffs will appreciate Ramada Hotel Singapore’s location along the Balestier Heritage Trail, which offers a glimpse of Singapore’s past as well as its vibrant food and social culture. 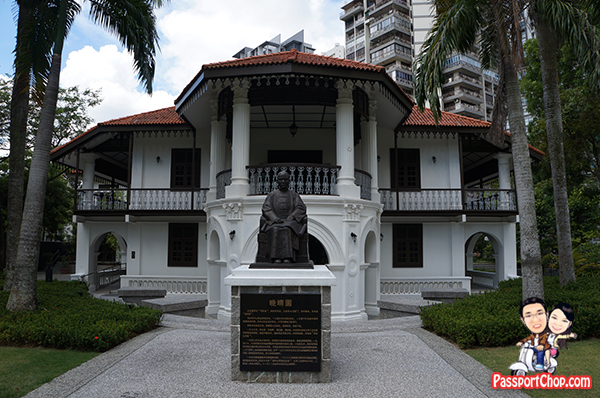 The Sun Yet San Memorial Hall is only a 5 minute walk across Zhongshan Park and entry is free for Singaporeans! 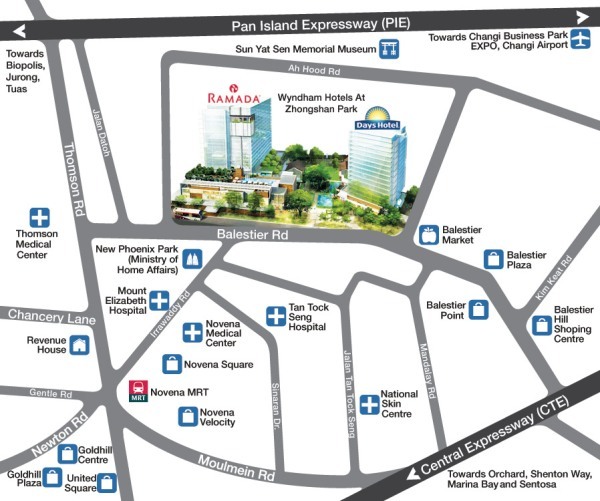 The Orchard Road shopping belt and the Marina Bay Financial area are conveniently located just 10-15 minutes by taxi. Resorts World Sentosa, Universal Studios, and Changi international airport are also a half-hour taxi ride away. My spouse and I absolutely love your blog and find the majority of your post’s to be what precisely I’m looking for. I wouldn’t mind publishing a post or elaborating on some of the subjects you write concerning here. Again, awesome weblog!